Thanks to Michelle Willingham, I have now seen the review for The Roman's Virgin Mistress in the RT. It is a pleasant review EXCEPT the reviewer manages to get the hero's name wrong and misspells the location. The story takes place in Baiae and the hero's name is Fortis. No Balia or Forte are mentioned. The modern name for Baiae is Baia. Minor points but to my mind important. The reviewer says that I am attempting to capitalise on the popularity of ROME. Although I am grateful to her for mentioning the tv series, it is more complicated than simply attempting to take advantage. When I first began writing about the period, the series did not exist. Serendipity is probably a better word. Or maybe there is something in the ether. I now see that there are several Viking set films due for release next year. I wonder if I shall be accused of trying to capitalise on them. And what about my Victorian set ones? Luckily North and South has been out for awhile. And I was forced to watch Richard Armitage in that and Robin Hood while I wrote the book, but really liked Toby Stephens in Jane Eyre far more. So Jack is probably a combo of the two. I write what I write because I happen to like the time periods, not because I want to capitalise on anything. I think it would show. But if serendipity happens, fine. If not, I trust other people will be like me and like the period. The children are on half term holiday this week. And this means all sorts of things are happening. Yesterday was my daughter's 14th birthday and it is hard to believe that it has been fourteenth years since that momentous event. The July RT came out .The Roman's Virgin Mistress has been awarded 3 stars. Nothing I can do about that, but I shall be interested to read the review. Last time Gladiator's Honor was reviewed, the reviewer mistakenly thought the Roman Republic had a royal family and she hated the modern language that was used. Ummm, I will pass on that particular reviewer's grasp of history but it did rankle as I never use the word *royal*. As for the other bit -- I don't write in Latin, therefore I think I am free to translate my words into English and to have my sentences make sense in English. The ordering of words is different in Latin. It used to drive me insane! Equally and obviously, we are not entirely sure how the Romans actually spoke in vernacular. I follow Lindsey Davies and others writers of Roman mysteries on using a more modern phrasing in any case. In Davies' latest novel, Saturnalia, she gives an explanation of where she gets her slang from and how she makes some of it up! Her characters are so wonderfully colourful that I hope she keeps writing just as she wants. As long as the novel feels authentic, then I have no problem with modern sounding language. After all, the reader has to be able to read it and much of slang in bygone eras is long forgotten now. So does the writer use the exact word (if known) or a close approximation? The past needs to be accessible. 100% accuracy is not an achievable goal. I suspect when people read my Vikings, some might say that I again use too modern of language. But I would ask them to find me the actual incidents of Vikings from the late 7th century speaking. Again the writer has to make them understood. The Vikings and Romans considered themselves to be modern. They could not really conceive of a time beyond of their own immediate horizon. Anyway, I am going to get back to my current Victorian. This is easier in some ways as we do know the words people used, and one can give a better impression. But given my background, I know that the words will still have a flavour of me in them. 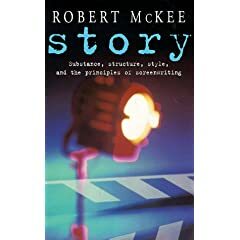 I am going to end this short series on McKee by briefly going his principles of story design. This is the heart of the book and where he uses the most examples. He also explains things much better than I. BUT what some people miss is the admonition at the start -- these are only tools to be uses AFTER you have your first draft, if the scene feels flat. They are not something you should be attempting to use consciously while you are writing the first draft of a scene. When writing a story, the protagonist is a wilful being and has a conscious desire. He must also have the capacities to pursue this desire. In other words, he is proactive and has the chance of achieving the dream, He must be in end willing to pursue the dream in spite of all the obstacles and when the end comes, the audience must feel that this is truly the end. They can not imagine an action beyond it. In other words, at the end , your readers need to be satisfied with no real threads dangling. This does not mean that there will not be a sequel simply that there is an ending, there is closure. Your reader may or may not find your protagonist sympathetic, but they must find the character empathetic. In short they must feel a bond of humanity with your main character. They do not have to like him or her very much at the start, but they do have to have that bond. That understanding. Likability is no guarantee of a bond. The reader identifies with deep character -- those qualities deep within the human psyche that only revealed when a character is forced to choose under pressure. This is why the inciting incident -- the start of the story happens when the protagonist's life is thrown radically out of balance. When this happens, the protagonist must react to the incident. Her desire to restore the balance in her life makes it the spine of the story -- it a Romance the spine of the story is always the growth of the emotional relationship. If it is not, you don't have a romance as the main plot, you have it as a subplot. As I write romance, I have to make sure that the spine of the story is the romance, even if there are other major subplots and with the length of my books, there are always other major subplots. The spine is sometimes referred to as the monomyth or the quest. And here it is useful to have read Volger. Unlike Volger though he does not believe in three acts. he simply warns about the problems of having too many acts, as the climax of each act must surpass the act before it and too many climaxes can dull an audience. After the Inciting Incident, the LAW of Conflict takes over: to wit NOTHING MOVES IN A STORY EXCEPT THROUGH CONFLICT. A turning point happens when a character is forced to make a choice -- a choice between good and evil or between right and wrong or black and white is no choice, even if it feels like one. True choice is dilemma. Things are not clear cut. Nothing is what it seems and everything has unexpected consequences. The crisis moment needs to be a static moment.It freezes everything. It is the instant before the dam breaks. It must happen On Stage. Anyway, I think McKee is for those people who like to take apart rainbows, put them together and still believe in them. There is absolutely tons in the book. Little throw away comments, that make me go -- ahh, so that's why this and this has to happen. Hopefully I have convinced one or two to pick up the book and read it. However, writers' minds work in many different ways and what speaks to one writer will leave another scratching her head. And itf you can only take one thing, then take away this craft and the study of craft enhances talent. It does not diminish it. I am starting to realize just how FULL of things I use McKee's STORY is. And I have not even gotten into his analysis of Story design. And it should be noted that I am just giving you the highlights as they occur to me. The subject matter is huge. As an side, I understand, his workshops are great as well. He goes through Casablance scene by scene. Right, so here is today's bit on character and characterization. Characterization is observable -- everything knowable through human scrunity, the hair colour, the eyes, house, the mode of transport, education etc etc The sum total of these characteristics makes an unique being, but it does not really tells anything about true character. This is often wht one feels out on character questionaires btw. As an aside, I rtend not fill out the questionaires until after I have completed the first draft. If I can't do it WITHOUT thinking too deeply then, then I don't know enough about my characters. I may not have written about a favourite thing, but I will know what the favourite thing has to be. Other writers approach it differently, but it is what works for me as often time, character is not cut instone until I have reached the climatic moment. True Character is only reveaked when a human being is put under pressure. The greater the pressure, the more significant the choice. Choices made when nothing is at risk mean nothing. It is the choices your protagonist makes when she is under pressure, that reveal her inner core of humanity. You need to make sure that the pressure is continually applied and that she has to make choices that have consequences. the choices she makes will reveal her innner humanity, in a way that makes her resonate with the reader. Making a chioice where there in no consequence is not really a choice. Choosing to tell the truth when a lie will save her life is very different than choosing to tell the truth when nothing will happen to her. A protagonist is always a willful being. She makes proactive, not passive choices. It are these choices that define the story. Equally, the revelation of true character as opposed to characterization is what fine storytelling is all about. For example, if your protagonist first appears to be a loving wife blindly devoted to her husband and at the end is still a loving wife blindly devoted to her huband, you have created a character with no growth arc and the character will feel flat. Through the pressure applied, characters need to reveal their inner cores and grow. Character arc changes inner nature for better or worse in the course of the story. The revaltion of true character must effect the climax. If the climax fails, the story fails. The ultimate pressure needs to be put on at the climax. It is the blackest of black moments when the hardest choices have to be made. One good trick he does say is to consider which actor/actress you would have play the role? What would happen if a different actor played it? How would the character change? What would be different about that character? He also says FALL IN LOVE with your characters. The reader can tell when a writer is not in love with his characters as they do not possess the same depth. Embrace all of your characters. Note this does not mean protect your characters. It means putting them under pressure and seeing how they react. He also says -- self knowledge leads to great character. The only person you can ever know truly is yourself. The root of all character writing is personal experience and personal emotion. The more you can understand your own humanity, the better your characters will be. Human emotions are what you want to write, and the only human emotions you can directly expereince are your own. The same is true for Hemingway, Steinbeck, Shakespeare, Moliere, Austen and Dickens. The only emotions they ever directly experienced were their own. It is the ability to communicate those emotions that results in fine writing. Much of this is probably not revolutionary, but I do like the way he says it and his examples. When I first read Story, it made sense. because this has a little to do with setting, creative limitation and genre, I am going to talk about AUTHENTIC here. To my mind, this is one of the most important parts of the whole McKee book. It was a revelation when I read it. An author means authority and that results in authenticity. The reader is willing to suspend disbelief because she is totally absorbed in the world that the author has created. The writer knows everything about the world she has created. The important words are: the world she has created. In the author's world she is God. No sparrow falls without her knowing why. It is not the entire world. There are far too many unknowable imponderables. The world an author creates is never 100% accurate. The author needs to always choose what to include and what to exclude. It is at best a reflection from a Claude glass. Claude glasses were popular in Regency and Victorian times among painters and tourists -- people who wanted to smooth out the ugly and have a certain view of the world. By using different tinted mirrors, the viewer was able to see the scene in different aspects -- fiery, moonlit, in winter etc, without ever having to actually be there. This is what story does -- it holds a smoky mirror up the world. What happens when an author creates an authentic world is that the reader willingly suspends disbelief. Sometimes, the reader can't details out of her head and goes to check, thus learning more about the time period or the location that the writer has set the story in. This is excellent as the story has touched the reader. Authors do research so they can decide what to leave in and leave out and to make their world appear more authentic, but they can never be 100% accurate. A historical written in 1957 is very different from a historical set in the same period but written in 2007 and is most certainly different from a contemporary novel written at that time. IE Jane Austen is contemporary, Georgette Heyer is constrained by her own reality just Nicola Cornick or Loretta Chase (to name two of my favourite current Regency authors) are constrained by theirs. I would never mistake them, and I adore them all. And indeed being in the midst of Decency and Disorder --The Age of Cant 1789 -1837 by Ben Wilson, I will never quite look at the Fancy, the Four In Hand or indeed Cambridge University during the period in quite the same way again. It does not mean my enjoyment of the novels is any less as the over riding STORY is what makes them. Accuracy helps to build authority and authenticity by providing the TELLING DETAIL. It means that when an author does take a leap, go up the wrong way on a one way street, the reader who knows forgives because she is so entranced with the story. It is the preponderance that makes the story, not the specific detail. McKee is very good on creative limitation and its purposes. It is slightly counter intituive, so bare with me. Many people think that creativity happens when you have a free reign. McKee argues (as does Twyla Tharp btw) that true creativity needs limitations. Just as every house must have a foundation and a framework, every story should have its limits. Without limits, your wheels spin. It is why writing genre frees the writer to be truly creative. This means creating a small knowable world. According to McKee, every good story takes place within a limited word. Even stories that seem epic such as War and Peace concentrate on a few families and their struggles. Dr Strangelove has three sets and eight principal characters. Gone With The Wind again once you start actually the world is small. The cast of main characters number only a few. The main focus is on Scarlett and her relationships with Rhett Butler,AshleyWIlkes and really Melanie. The key to writing a good story is to limit your world. This does not mean to create a trivial world, but one where you as the writer know everything about the world.Knowledge is power. The smaller the world, the more God like you as a writer become. As a writer you must know everything. The reader does not need to know everything, but you need to by the time you finish YOUR LAST DRAFT. Notice the emphasis. You do not needto know everything before you start writing the story, just by the time you finish. Small means that the writer knows the laws and probablities of her world. Your story must follow its own internal logic. It is the relationship between coincidence and causality or how to avoid deus ex machina. Small means you can explore the complexities of your characters and their interactions with each other. Every time you expand your speaking cast, you add complication but you sacrifice complexity. And the size of your cast is in part determined by what you want your story to do and what sort of genre you are using. For example an adventure film such as James Bond does not have a great of complexity. James Bond is shaken not stirred. He does not really change from film to film. The excitement is the complications that he faces. The cast of characters is large. On the other hand, romances are very much focused on the interpersonal relationships, and the characters do change and grow. You get to know them, you walk in their shoes. They are complex. Keep your cast size small forces the writer to increase the complexity of the relationships between the characters. McKee also dissects the variuous different genres, explaining generally what each is about. It is very interesting and helped me to understand WHY pure detective stories do not make good romance. Clue it has to do with the passivity of the progtagonist. IN short limitation is a good thing. It frees your creativity because it forces the writer to find new ways to say things. Because writers do have to try different ways, not everything will work. It is the getting it right in the LAST DRAFT that counts. He also makes the point that no one has to see the 90% of a writer's work that is less than the best. When a reader reads the finished book, the reader does not know how many drafts you have written to get there. She only knows the feeling of satisfaction that she gets from reading your book. Questions/ comments/ Have I convinced you to buy this book yet? Right as I got two comments endorsing this short series, I will continue and hopefully convince you that you should purchase this book if you are at all interested in writing commercial ficition. One very big plus in his book is that as it aimed at screenwriters -- all the examples are films. This means rather than evaluating the book, I am able to see how the vision works out. After giving you reasons why you should learn about craft, McKee presents the basic forms and he starts with structure. Just as a house needs a framework, so does any film. This is a rather technical part of the book and it is easy to get bogged but it does have some of my favourite bits. One is the explanation of the types of plots -- archplot, miniplot and antiplot. As I am a commerical writer, my plots fall in the archplot spectrum. This means I have closed endings -- no dangling threads. My protagonist is active and there are external conflicts. McKee defines external conflicts to include social relationships. A miniplot has a pasisve protagonist, open endings and mainly internal to that person conflicts. Antiplots are literary sphere and so I don't needc to go into them. The thing you need to be aware of is that the further you move away from the archplot, the size of potential audience decreases. The multiplot is half way between the arch plot and the mini plot. It can be best described as multi protagonist. Because you do have multi protagonists, you will of a necessity have less time to spend with each of them.Think The Fugative v Parenthood. There are certain directors who are happy to make films for smaller audiences. If you are going to do that, you also have to be prepared to come in under budget. In my terms, when you write for a niche market, you must expect a smaller advance as then you will be able to earn out your advance. Publshiers like studios wantto make money on their offerings. It is just some thing to be aware of. I know for example in historical romance Georgian/regency/Victorian occupy a far greater percentaage share of the market, to expect the readers of say Roman to be equal to the number of Regency is unrealistic, and I need to tailor my expectations accordingly. I find this view comforting in the run up to royalities btw. he also discusses linear v non linear, casuality v coincidence. All terminolgy that a wrtier might run into when thoughts come back from your editor. He believes that writers should work towards mastering the archplot before attempting the other forms. Much I suppose as Picasso did with art. If you have mastered the classi form, you can understand the why and how of changing it.It no longer feels confining and you begin to see the possibilities. He ends the chapter with the very importnat point: THE WRITER MUST WRITE WHAT SHE BELIEVES IN. This includes the form, but first you have to figure out WHY you believe in it. Do not break the rules of commericial writing simply because you want to show your independance, but break the rules because there is no other way to tell your story. You have to truly believe in a form to be able to write it. So I am going to do a small series on some of the more important points in McKee's book. These may not be everyone's but they are mine. Hopefully it will convince some to pick uip this book or at least to ponder his ideas. What i am talk about today is Powers and talents. It is a short but I think hugely important part of the book. It actually gets to the nub of the craft of Story. According to McKee and I have no reason to doubt him, there are two types of talent in story writing. First is Literary talent. This talent uses words and is the putting together of words to form images. It is a common talent. A lot of people can produce wonderfully descriptive writing. But literary talent does not necessarily lead any where. A description of a sunset stays a description of a sunset. There is no movement. The base material of literary talent is words. Story telling talent is much rarer. It is the ability to hold an audience, to tell a story in such a fashion that the audience is transfixed. It is what causes the pages to be turned. WIth storytelling talent, even the most mundane can be exciting. The base material for story talent is life. Commercial publishers buy story telling talent. They want page turning reads that people come back to time and again. The desire to relate an incident in an intersting manner shows that you have some sort of story telling talent. It is the combination of the two talents that results in a truly great writer. Talent can not be taught, but it can be control by the learning and studying craft. You do not need to have studied craft to produce a publishable book, but if you want to stay published over the long term, you need to klearn how to control your talent. You need to learn the why behind the rules. You need to master forms and not formula. It also makes it much easier when editors come back and say -- this is wrong with your novel. With the knowledge of craft, you can see how to rewrite and make better, rater than flapping around in the dark and hoping. Craft is what allows the writer to control her environment, rather than having her environment control her. Because I apt to have attacks of the crows of doubt. Or simply to forget. Rereading the passages where he says these things makes me feel better. It gives me the breathing space I need. It means that I don't have to get things right the first time, because I know I have learnt the craft tools to get it right when it dfoesn't work. In other news: the Late Night Praty ducks have discovered the compost heap. where they hide. Then as I return from locking the other ducks in the duck house, one quacks, very loudly, making me jump. The LNPD then rush across the bridge. They consider this a good game. Particularly as we then play round and round the duck house and the other ducks come out and join in the fun. I find it less amusing. My copy of Loretta Chase's new novel Not Quite A Lady arrived yesterday. It went straight to the top of the TBR list and it is very good. However, every time she mentions The Philosphical Society, I get pulled out. I keep wanting to know which one, and why do they always call it the Philosophical Society? My basic problem is that many years ago we used to belong to the Literary and Philosophical Society. We gave up membership once I had my eldest because the trek into Newcastle for me was too long and my dh did not really use it that much. An economy measure. The Lit and Phil is one of the few remaining independant libraries in England. Members can take out any book published after 1850. They also give lunch time concerts, maintain an excellent collection of music and an outstanding collection of tracts about local history. The Reading Rooms remain much as they were in 1825 when it first opened. George Stephenson demonstrated his miner's safety lamp and the Duke of Sussex laid the corner stone in 1822. It was founded in 1793. The Manchester Lit and Phil opened later. The YPS -- Yorkshire Philosophical Society started in 1822 and is very involved in setting up the York Museum where I saw the exhibition of Constantine the Great last year. The Bath Philosophical Society was founded in 1799 and later became the Bath Literary and Scientific Institute and then the Bath Royal Literay and Scientific Institue after first William IV and then Queen Victoria agreed to be the patron. The Whitby Literary and Philosphical Society was founded in about 1822 as well. It too is a library and museum. So as I am reading Not Quite A Lady -- I keep wondering which Philosophical Society are we talking about here as there was this movement... And why are they calling it The Philosophical Society as if there was only one. A small point but these societies did much to found musuems and preserve history as well as providing a place for better learning. But as a whole, Chase's latest is excellent and well worth a read. Last night the BAFTAs were on. Life On Mars only won the audience BAFTA. Which goes to show that there are a lot of dedicated fans out there. Philip Glenister, looking very dapper in his dinner jacket announced the winner for the Best Actress. John Sims looked very uncomfortable when the BestActor was announced. My heart went out to him. It is so hard to sit there for those few seconds before the winner of an award is actually announced. 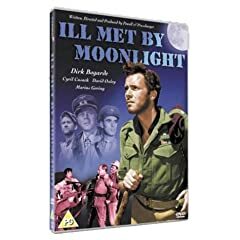 However, I spent most of the evening watching one of my favourite films -- Ill Met by Moonlight. I happen to like it because it is a true story and has some lovely footage of Crete. We have decided that we need to go back to Crete. The movie is based on the recounting of W Stanley Moss about his adventures in kidnapping a German general. He was ably aided and abetted by Patrick Leigh Fermor, Xan Fielding and a whole hot of Cretans. It was most the Cretans who were responsible for the success of the mission. PLF is one of my favourite no fiction writers. He has a wonderful gift of the English language. His books about travelling across pre WW2 Europe on foot depict a vanished age. If you have not yet read him do. Another book based around the same incident is The Cretan Runner and it too is a wonderful Boys Own adventure story. Anyway, the film is very enjoyable -- all the more so for being based on a true incident. When we were in Crete lo those many years ago, it was obvious that WW2 had marked the island. At the monestary, the priest told the story of how the Germans tried to take the piece of the true cross and were unable to get the plane off the ground. Shades of Indiana Jones here. The priest rapidly changed the subject when two Germans joined the tour! Work wsie -- the wip is going fine. My crows of doubt seem to have flown for the moment and I am concentrating on getting the draft down. I keep telling myself -- the sooner it is down, the sooner I can actually work with it and make it better. I do think I was correct to basically begin again as I think the overall story will be much stronger. I shall save it until after I have finished writing this wip. I have a ficiton in my head that my editor waits for my next ms. It does not matter that Loretta Chase is one of her favourite authors -- she'd far rather read one of my books. It is a nice fiction, a pleasant fiction and it keeps me going. My editor is not going to disillusion me about this.... I have a little post it pad that says -- my editor can't wait for my next book. I choose to believe the nice part of this sentiment. 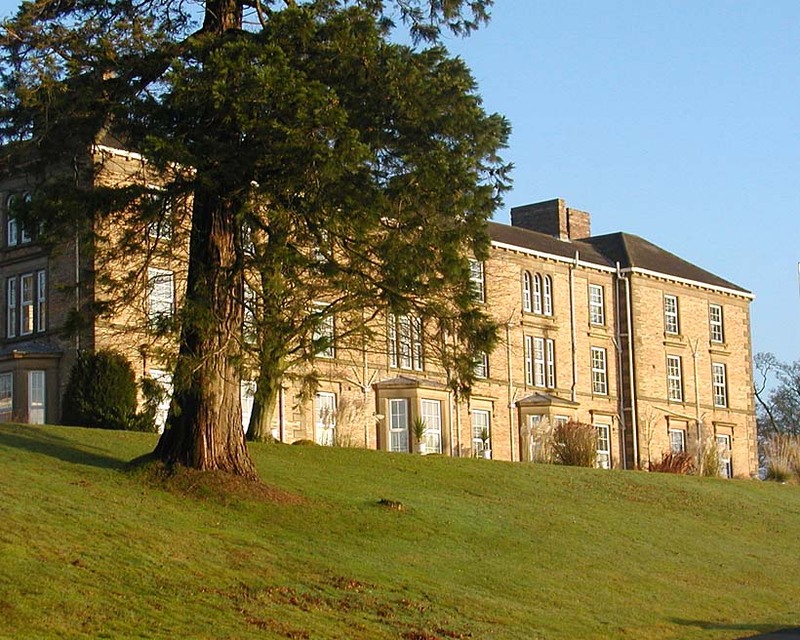 My characters are proving slightly difficult but have now reached gilsland and Shaws Hotel. The photograph is of Gilsland Spa which is the name that Shaws now goes under. I am writing about the old hotel, the one that went up in smoke in 1859. It was a very popular place during the Regency period. Sir Walter Scott proposed to his wife here. Thus creating a Tradition. The sulphur springs were also popular. I wish that I had chosen this tack to begin with and would not beel under pressure but I know the ms will be good. I love the characters and once I have Lorratta's book in my hand, I shall use it as a carrot. In my garden I am curently fighting my annual battle with the nettles. I keep telling myself that one hour per day will help eliminate, but somewhere I think there is a mother nettle, one which sends out runners and keeps sending them out. This mother nettle is closely related to the mother ground elder. You do not want to know the weeds my garden possesses. In positive gardening news, my dh informs me that we now have over 20 cannas. I like cannas, They always remind me of the holiday we spent down in and around Hastings. We purchased the cannas from Christopher Lloyd's Great Dixter. Mr Lloyd was truly one of the 20th century's great gardeners. No sooner had I sent off my revisions than my proofs for A Christmas Wedding Wager arrived. I had been waiting for them for awhile as my current wip is linked to the story. Luckily from my reading, I see that I did layer in quite a lot. Lottie is just as I remembered her. And as another good point, I did not mention her age. This is excellent as I can make her a tiny bit older. She is a bit of a challenge as she is different from my normal heroines, but my daughter adored her and so I am bowing to her wishes. Proofs require a lot of concentration. Mainly when I read them, I am reading for flow and looking for mistakes. For example, I must have typed realty when I meant reality. Somehow the copy editor missed it. And it is a truism that no matter how many times people go over things, they will miss items. I do use a ruler so that I am concentrating on each line, rather than having my eye skim the page. I have done my best and I know several other people will be looking as well. But all in all I was pleasantly surprised at well the story flowed. It is nice Christmas story and I had a tear in my eye at the end. So hopefully readers will enjoy it when it comes out in December. However, I no longer have any excuse not getting on with my current wip. I have finished my revisons and sent them off. Fingers crossed that they are fine. All I know is that I like the story much better. 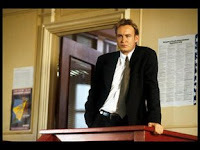 This is the one that had Philip Glenister as the hero inspiration material. But I did have to make him more ruthless than Gene Hunt. My basic problem with the manuscript that I sent in was that I took the wrong angle on a major subplot. And as a fan of a major acarthic battle at the end, I generally like to have one as well. However, in this story, it wasn't necessary. I had enough emotion to see me through. And actually in my current wip, I think I have made the same mistake -- coming up with an intrigue type that is starting to demand space. Or rather one that I don't particularly want to write. However, there is very much a plot I want to write. It will suit the characters much better and was actually going to be the subtext. I am just going to have make it the main arc of the story. And it will be fun to do. As it is a Victorian, perhaps, my heor doesn't havet o be as Alpha male, but he still has to be up there. So my big take away from this round of revisions is not to be afraid of the emotional clash. Those emotional journeys must be shown. Today I took a small break from revisions. Actually it was in between drafts and so it is good to get my brain clear. We drove up to a friend's house in the Scottish borders. They were opening it for charity. I was always envious of their old garden, but their new garden is absolutely glorious. 10 acres covered in a riot of azaleas, rhododendrons and other acid loving plants. They are right on the river Annan and the weather is just slightly more mild. Thus many things were slightly further on. Purple alliums vied with pink oriental poppies to create a carpet of colour. In the evenings, otters play in the upper pond. Unfortunately the house was built in 1863. An admiral and shipping magnate had it built so he could watch the water. And so I could not really used it for research purposes but it was one of those hidden gems that made me -- yes this is what Britain is supposed to be like. Because of the scale of the garden, I couldn't be envious. All I could do was enjoy. Now is the time of year to go garden visiting. The spring bulbs may be over, but the rhododendrons, azaleas and roses are just coming into bloom. By visiting the private gardens open for charity, it gives one a chance to snoop around and think about settings. When we lived in our old village, the annual garden open day was affectionately known as the garden snoop around. And there is one house -- the Newbrough Park that I still need to find a story for. It just is. And the owner of Newbrough Park during the Regency period has a life story that read like a Catherine Cookson novel -- illegitimate, abandoned on her father's doorstep, her grandmother insisted that she be brought up properly as the father had seduced a gentlewoman. She never married and became one of the largest landowners in the North East. Equally Nunwick Hall near is fascinating with its hostas growing in the ruins of the convent. So do yourself a favour -- visit a garden today. Anyway, the final edits of my Viking are calling. Hopefully my editors will like what I have done. I am working through my revisions and although I may not always agree with her solutions. They always spark ideas. I think the reasoning is much more solid now. As Kate Walker said to me -- remember you are the creative person. It i s your job to come up with the ideas and improvements. If you can find a better way, use it. It is my editor's job to point out where those improvements need to be made. And she does an excellent job at doing that. I only hope the changes I have made will meet with her approval. I Personally I think the story is a stronger one now. Fortunately I also think I have solved some of my problems for my current wip as well. It needs to be started after the first few pages. My latest set of revisions have arrived. In some ways they are challenging, but in many other ways, they are easily doable. I do hate it when my editors use the pat phrase -- I know this looks like a lot of hard work. Actually for me, revisions are the fun part. The hard work is the waiting. Finally with revisons I have some sort of direction and can concentrate on what works and what didn't and finding a way around my editors' concerns. The point is that they do see the potential in the book and think it could be a very strong book. It is an odd thing about writing -- the challenges for every writer are different. What is hard work to one is plain sailing to another. The important thing for me is that my editors have the faith in me that I will get it right. I know when my writing is going slowly, it is when I start finding excuses to do that extra bit of research. Today, my mind was all vexed by lights -- lamps and candles. Which would my characters use? How would they light them?like? And that sort of thing. On friday, I spent my middle's riding lesson reading about the Lost Houses of Northumberland. I earnt a lot but did not really advance my own story. Ho hum. One of my favourite books for checking out details like lighting or refrigeration is Behind the Sceness --Domestic Arrangements in Historic Houses by Christina Hardyment. I know I have mentioned the book before but it is worth dipping back into. It has quite a good history of candles and when various things happened. For example, cheap candlelight came about in 1831 when the tax was removed, equally a new way of producing stearine from vegtables oils was discovered about then. It was not until 1857 that paraffin candles were marketed. Beeswax candles were only used for churches. Anyway, I found the research interesting nd I also learnt about matches and when various types of matches were invented. But I did not make as much progress on my wip as I should have. Progress was also not helped by it being Bank Holiday over here and having the family around. The possibility of more ducklings! Argh! The duckings are doing well. And one or two people have been approached with the possibilty of providing good homes. My heart sank this morning when I discovered the orginal mother duck sitting on a nest of eggs. If she follows previous form, she will hatch them all. My dh has also reverted to type -- oh let her, he says, she is not hurting any one. Uh, no I don't think so. She can sit there until the end of the bank holiday but the eggs will be removed. The ducklings this morning could not find their way out of the enclosure. My youngest was herding them. Their mother came back in, quacked in an annoyed voice and head back out. the ducklings exchanged quick glances and trooped after her. The communication between ducks never ceases to amaze me. We also have young song thrushes, starlings and a host of other broods in the garden. ON the writing front, it all goes slowly. I had a RNA Northumberland meeting yesterday. It wastruly lovley to see the number of writers there. Then my paperback author copies for The Roman's Virgin Mistress (Uk version) arrived. I spent time getting reviews organized and books sent out. Georgina Devon and I agree about the cover for Noble Beauty. It is truly beautiful. I have put a somewhat blurry picture of it up on my wall. It is the sort of picture that I love buying cards of. Valens había sobrevivido a más de una docena de luchas de gladiadores y su fuerte masculinidad desataba las fantasías sexuales de muchas mujeres. Un hombre como él vivía al margen de la sociedad, por lo que una mujer noble como Julia Antonia jamás debería acercarse a él, que era poco más que un esclavo. Para Valens, Julia era un tentador recuerdo de la vida que le habían arrebatado. Si quería hacerla suya legítimamente, antes tendría que luchar una vez más… y ganar. I found out today that A Noble Captive has been released in the Australian/New Zealand market as part of a 2 in 1 Quills duo -- Noble Beauty. The other half is An Unconventional Widow by my good friend Georgina Devon. I think the cover is very pretty. A Noble Captive did get some good reviews. Romance Junkies said: Rarely explored in historical romance, this time period sets A NOBLE CAPTIVE apart from the norm. The island temple comes alive as well as its people's customs with Michelle Styles' unique blend of historical detail and intrigue. Her style is distinctive and made me feel as if I was right there experiencing it all with the characters. I felt the impending storm of emotions and smelled the salt air through her words. An exciting adventure with strong characters you'll root for, A NOBLE CAPTIVE will enchant you. 4.5 Ribbons. We have ducklings -- six thus far. They are very cute. Only one is yellow. this year, however, we didn't want ducklings. The mother duck snuck away and had her ducklings. SIGH. We shall have to let nature take her course. The ducklings are having to fend for themselves in the garden. This afternoon they were sitting on the back lawn, and chasing flies. There have been reports in the newspapers about left handedness and how it can shorten your life. I will admit to being left handed. There is nothing I can do about it. It was the way I was born. It can be awkward at times but mostly I cope. I keep telling myself how many creative people were born left-handed and leave it at that. I tend not to use special left handed tools, although sometimes I am given them. I am at a loss to explain a left handed fountain for example. I do have a pair of left handed sewing scissors. They work because they are sharp. When I was little, I used to be made to use the left handed scissors at school -- they were always blunt and would never cut paper. And I have learnt, I hope not elbow people at the table. I tend to try to sit so that I am at an end with my left elbow free, but maybe that is just a hangover from when I was little. I certainly don't consider it a disability, just vaguely awkward at times. My wip continues and I am waiting for my revisions. I am planning on sending out my newsletter in the next few days -- probably after the Bank Holiday, just because I am being lazy. I googled Sold and Seduced today was surprised to discover that Amazon Canada is offering both it and A Noble Captive. I have no idea why they are doing this, but in case anyone was interested, I thought to point it out. The one that made me laugh was Amazon.co.uk offering a used copy of the North American paperback edition of The Roman's Virgin Mistress. They have been offeringthis for awhile. I have no idea who put it on, but I doubt the copies have been printed yet. The only arc that I know about is the Romantic Times one -- but why offer it in the UK and not the US? It is a mystery to me. I am being slow with my newsletter. It should be finished tomorrow morning. There will be a contest for the hardback version of The Roman's Virgin Mistress. For a number of reasons TRVM is my favourite Roman set historical that I have written, so I am very excited about it being released. Currently I am workig on the motivation of my characters. I had become fixated on one thing and had lost the opportunity for good conflict. This stymied me. I have now made a slight tweak and I think it works better and will ultimately increase the conflict for my hero. How can he want two things at the same time that are mutually exclusive? If one, not the other. Will he be satisfied with just one, or why must he have both? Ithink it is starting to come together.